Are you looking to have a great month of networking? Who isn’t? Who wouldn’t? A great month of networking can give you momentum that leads into the next month. Then you have another great month of networking and before you know it, you have strung together a series of great months. From there, you are well on your way to having a great year and we all know that one great year of networking can lift your business to whole new levels. So that begs the question, How do you ensure you have a great month of networking? Certainly, like anything, it starts with a plan. You need a plan that has you doing the right things. Getting the right professional exposure, engaging in volunteer activities and making contacts are just a few things that should be part of your plan. More important than the plan, however, is the action. And not just any action, but consistent action. Your actions need to be almost systematic so that it ensures you follow through with the plan. One thought on getting this systematic, consistent action is to use a checklist. If you are interested in a checklist for a great month of networking, you could just draft one up. Or you could simply go to http://www.amspirit.com/pdf/insight_10.pdf and download a complimentary version. Whatever you choose, make it a great month of networking. Wayne Booker, of Prudential CRES Commercial Real Estate and member of the Dublin Chapter of AmSpirit Business Connections, was named as the 2009 top Commercial Agent for Prudential Commercial Real Estate in the Business First List of top ranked Commercial Real Estate Brokerages. In addition, Wayne received an award from Prudential for having the largest single transaction in the region for 2009. He can be reached at (614) 223-9595 or at waynebooker@aol.com. Who Is Your Networking MVP? 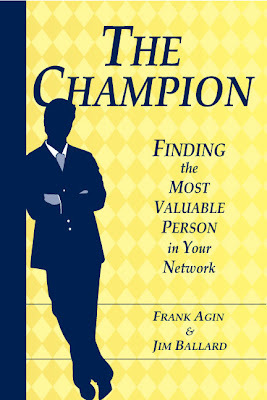 Who is the most valuable person in your network? Is it that person with that you can rely on to always be self-assured and optimistic no matter the situation or circumstances? Or, is it that person who is predisposed to contributing to the world around them, every watchful for that opportunity to give or lend a hand? Or, is it that person who endeavors to always be fair, always be honest and always do the right thing no matter what it means for them? Or maybe, is the most valuable person in your network that person who is a combination of all three – a confident presence, a generous disposition and an unwavering integrity? AmSpirit would like to CONGRATULATE Lucy Grosz, of Alta Vista Benefits, Area Director and member of the Pulsar Chapter, for be appointed to the Executive Board of the Columbus Association of Health Underwriters (CAHU). AmSpirit would like to CONGRATULATE Amy Schulze, of ACS Gahanna, Area Director and member of the Morse Crossing Chapter, for making the Dean’s List last semester at Ohio Dominican University. Her accomplishment was in the April 28, 2010 issue of Gahanna News. In the book Power Networking, authors Donna Fisher and Sandy Vilas indicate that there is a new way to approach our networking interactions that eliminates rejection as an issue. In other words, if we approach people with the mindset that we are merely someone who is interested in sharing information with them (referrals, contacts, insights), no rejection can result.